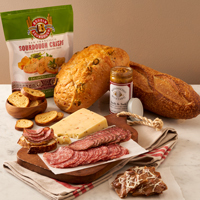 Treat your friends to our Farmer’s Market Tote full of fresh local Bay Area treats. They will receive one each of our 1 lb. sourdough long and round loaves, a 8 oz. Columbus Italian Dry Salame, an 8 oz. BelGioioso Mozzarella Prosciutto Basil roll, a 5.3 oz. wedge of Sonoma Jack Original Jack Cheese and a 5 oz. box of assorted Ghirardelli chocolates. All will arrive tucked into our cheerful market tote, which they will surely enjoy using again and again at their local farmer’s market! 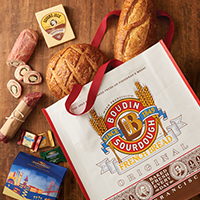 1 – Boudin Signature Reusable Shopping Tote. *due to seasonal availability we reserve the right to substitute the Chocolate and Mozzarella items with suitable replacements of equal or more value. From JT Jurach of stafford, Virginia on 5/14/2018 . From daniel swift of dunmore, Pennsylvania on 2/15/2018 . From Anonymous of portland, Oregon on 1/13/2018 . From Karan Ogilvie of Clearwater Beach, Florida on 1/12/2018 . From Sher of Oceano, California on 1/7/2018 . From stan ayers of rancho cordova, California on 12/30/2017 . From Patricia Gasper of North Port, Florida on 12/24/2017 . From ELEANOR PATRIDGE of San Bernardino, California on 12/24/2017 . From Anonymous of Phoenix , Arizona on 12/23/2017 . From madeleine malone of Oakland, California on 12/23/2017 . From David Reid of Millbrook, Alabama on 12/23/2017 . From Sheryl Griem of Phoenix, Arizona on 12/9/2017 . From Anonymous of Washington, District of Columbia on 8/23/2017 . From NANCY TERAKAWA of LAS VEGAS, Nevada on 8/13/2017 . From Anonymous of Cushing, Oklahoma on 12/19/2011 . 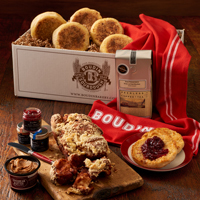 Gift includes sourdough English muffins, sweet cinnamon delight pull-apart bread, Epicurean Butter Cinnamon Brown Sugar butter, a trio of San Francisco Jam nation fruit spreads, Peerless Fog Lifter Blend coffee and a Boudin Jacquard woven dishtowel. Includes a 1 lb. 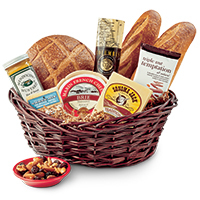 sourdough round & 2 baguettes, Sonoma Jack Traditional Jack Cheese, Marin French Brie cheese, Columbus Dry Salame, Chuao Triple Nut Chocolate bar, Yolo Farmstand Snack mix, Mendocino mustard, all in a woven basket.